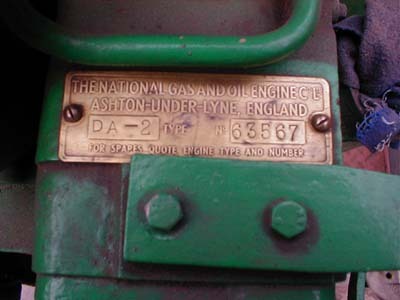 The engine which is to be installed in Hadar is one of 2 known to be remaining of the Type "DA-2" engines built by the "National Gas and Oil Co. Ltd." at Ashton-under-Lyme. Mr H. N. Bickerton founded the company in 1889. This particular engine carries the Serial No. 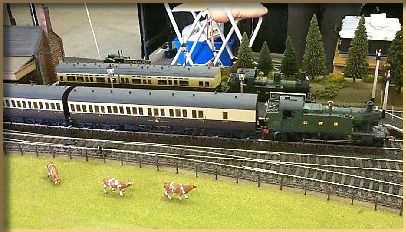 "63567". It was purchased from a funfair where it was being used as a standby generator, and prior to this it was at Keighley railway works, also as a standby generator. It is a two cylinder unit with a bore diameter of 4⅛", 105mm developing an impressive maximum 30bhp, or 27bhp constant at 1500rpm, and weighs in at a mighty 1500lbs, or 2/3ton! Its physical dimensions are Length (including starter handle) 43½" 109.2cm, Width (flywheel) 25" 63.5cm and Height 45" 114.3cm. It is being marinised and refurbished by Tony Redshaw at his new workshop in Braunston. It requires a starter ring to be fitted to the flywheel, and starter motor. I have chosen to have 2 alternators, one 45amp (starter battery) & one 90amp (domestic battery) to be fitted. If anyone has any furter information on this engine please get in touch with us by leaving your message, and we will contact you back. 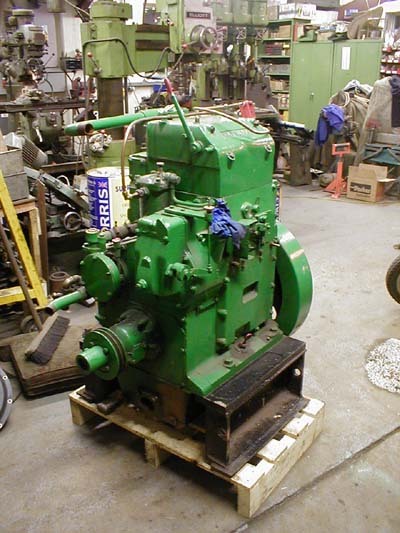 We would love to find out further details on our engine if there are any out there. We have made it through week two of our boat build. Monday saw the base of the counter tacked into place.The fuel tank sides were also tacked into place. After working out the templates for the front bulkhead, the steel was cut out and tacked into place. We could now appreciate how large Hadar was going to look from the front. Roger put in place wooden templates for the bow structure, so we could see what the complete bow would look like, and we both through wow how impressive she was going to look, not to mention wide LOL. They also tacked in place the counter sides, so the stern has really taken shape now as you will see from the photographs. Having seen the templates for the bow structure, they used those templates to cut out the steel pieces. The rest of the week was spent working on other boats in the yard, so that they are already for Christmas. 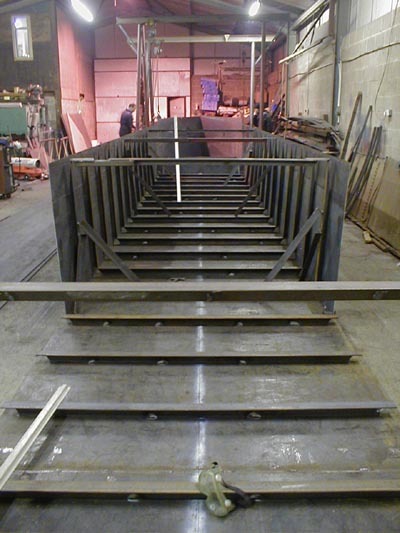 One of the boats is going out for its shake down over Christmas so it has been important to make sure it is ready on time, and the steel arrived for another job in progress, so they were busy catching up on that as well. As usual all up to date photograps are in the album, just click on Hadar photo's in the menu and you can enjoy watching Hadar's progress along with us. See you next week if there is anything to report. May we take this opportunity to wish everyone a very Happy Christmas, and all the very best for 2006. Having watched all the steel arrive, we are now watching as Hadar come's together. We will do a weekly report, hopefully on Monday's so we you can see how she has progressed. The base plate welding is completed and the first cross members are put in place, starting forward of the engine room. The stern and swim area (the "swim" is the section of hull at the stern which narrows in underneath the waterline to the propellor and rudder) is all marked out ready. Wed 7/12/05The final cross members are added and one mid-section side plate is tacked into postion, ready for welding. The second mid-section side plate was prepared and tacked into place. The skeg (the skeg is a horizontal fin which extend rearwards from the end of the swim below the propellor to support the bottom end of the rudder) was welded into place at the stern. The forward and rear engine room bulkhead bases are tacked in place. Both rear side-plates have been tacked into place forming the swim. Today more steel arrived for our boat. So we now have everything that is needed to get our boat started. 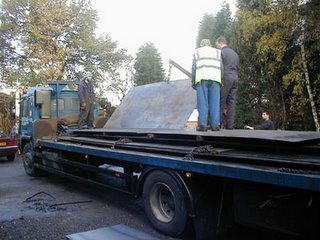 We stood and watched as the steel was unloaded off a lorry, which had come from York. Once they had unloaded all the steel into the shed it was time to get the base plate laid out and work began on Hadar. Luckily we are moored at the boat yard, so we will be able to take loads of photograph's and keep the diary up to date. So watch this space for further updates.